Announcement Glass magnets, fridge magnets, funny sayings, pocket mirrors, find them all and more in my cute little store. Welcome to my shop. I love making everything here and try to list different things all the time. Convo me anytime, I love to have a chat. Glass magnets, fridge magnets, funny sayings, pocket mirrors, find them all and more in my cute little store. Pocket Mirror - Fly Away - Silver with Bird - Hand Lettering, Quote. Pocket Mirror - Love Joy - Red Checks - Hand Lettering, Quote. Pocket Mirror - Bird - Spread Your Wings and Fly - Pink and Blue Polka Dots - Hand Lettering, Quote. Pocket Mirror - Grateful - Green - Hand Lettering, Quote. Pocket Mirror - Laugh Loud - Blue - Hand Lettering, Quote. Pocket Mirror - Dream Big - Coloured Stripes - Hand Lettering, Quote. Pocket Mirror - Faith Hope Love - Colourful Stripes - Hand Lettering, Quote. Pocket Mirror - Enjoy The Moment - Red, White Polka Dots - Hand Lettering, Quote. Gorgeous and very unique glass magnets. These are truly beautiful and made with a lot of care and heart. Welcome to Designs of the Heart. Thanks for dropping by. I have been making craft and things since I can remember. Over the years I have tried pretty much everything. I live in Australia in the state of Victoria. It's a great place to live and we love exploring our city. I love being on Etsy and have met so many great people. I am committed to handmade and try to buy it whenever possible. I hope you enjoy what you find in my shop. Please contact me if you have any problems, I will always try to work things out. Any problems will be handled individually. All my Prices on Etsy are in $AUD (Australian Dollars). Payment is to be made within three days, unless prior arrangement has been made with me. If you have any questions please convo me as I am happy to help. Please make sure your Etsy Address is the same as Your Paypal Addres. If not please let me know what address you would like it sent to. I try to ship as soon as possible after receiving payment. If it is a personalized item I will let you know how long it will take. 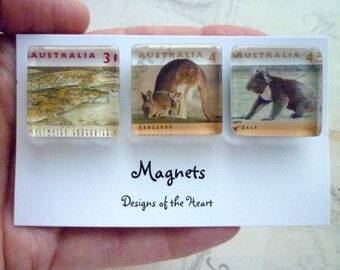 I use Australia Posts Airmail Service for all Overseas Orders. I pack your order extremely well, I always like to pack as I'd like my orders to be packed, so that your order arrives safely to you. I take time with my photos trying to get them as close to real life colour as possible but all monitors are different so there could be slight changes. The patterns on the magnets may differ slightly from the photo as different parts of the paper are used each time, just making each piece individual. For wholesale inquiries please send me a convo.